Exclusive and exquisite Palms Place Hotel and Spa epitomizes the world famous Palms lifestyle with upscale accommodations delectable cuisine and luxurious amenities that go unrivaled both on and off the Las Vegas Strip. Designed by famed architect Jon Jerde the 47 story Palms Place provides a haven for its patrons with a gate to ensure privacy a porte cochere entry 24 hour valet with covered parking and 24 hour doorman service. Studio is 600 square feet with hardwood and marble flooring. Room includes a King bed with Italian bedding and an additional queen sleeper sofa. Guests will enjoy sophisticated interiors and designer accessories including a fully equipped kitchen two 42 inch plasma televisions rainfall and multi jet shower heads and a jetted tub. The serenity of the property continues beyond the rooms. Drift Spa provides a relaxing retreat from the outside world with a decadent blend of ancient and contemporary treatments a salon operated by renowned color specialist Michael Boychuck and the first hammam or Turkish bath in Las Vegas. It is also home to the only Las Vegas location of L.A. s famed Sunset Tan known internationally from its hit E Television network reality series. Along with 24 hour room service guests can dine at an exclusive restaurant by famed restaurateur Kerry Simon Simon Restaurant & Lounge or unwind with a drink at the lobby bar Rojo. And once you re ready to party you won t have to look far. Guests of Palms Place have direct access to the Palms Casino Resort s world class gaming dining and nightlife via the skytube an elevated enclosed moving walkway that joins the two properties. Please Note that there is a cleaning fee of 30 USD a day per room. Please note that these rooms are managed by jet luxury resorts. These rooms are the same rooms offered by the hotel directly with the same amenities provided. 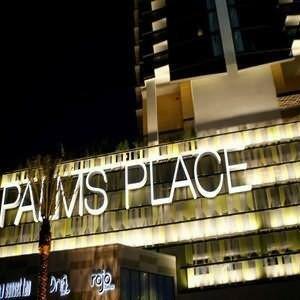 Exclusive and exquisite Palms Place Hotel and Spa epitomizes the world famous Palms lifestyle with upscale accommodations delectable cuisine and luxurious amenities that go unrivaled both on and off the Las Vegas Strip. Designed by famed architect Jon Jerde the 47 story Palms Place provides a haven for its patrons with a gate to ensure privacy a porte cochere entry 24 hour valet with covered parking and 24 hour doorman service.